To celebrate the age old act of putting pen to paper, online retailer and gift hub Pen Heaven present their Handwriting Matters campaign – launched to proliferate the art of handwriting and promote the many benefits associated with writing by hand. More than half the people quizzed by Docmail admitted their handwriting had become progressively worse over time. And there is a danger that if society doesn’t place more importance on putting pen to paper, younger generations may lack the ability to write by hand altogether. Schools in Finland are getting ready to drop cursive handwriting from the curriculum completely. From 2016, children in the Scandinavian country will learn to type instead. And the US education system stopped considering handwriting as a compulsory skill in 2013, leaving individual states free to decide whether to teach it in the classroom or not. Writing by hand is a vital life skill but the less we do it, the harder it becomes. Through the Handwriting Matters campaign, Pen Heaven are urging people to ‘use it or lose it’ and are supporting the education of handwriting by offering students FREE writing essentials through donations to charitable causes. Why not join our debate and help us keep handwriting memorable! Providing a plethora of writing instruments to suits all styles and levels, Pen Heaven also offer the ergonomic Yoropen, designed for comfort with an adjustable grip and finger support to help you practice your finest script. Expert advice, along with journals, jotters and notebooks are also available, including an in-house personalization service. A Chester-based mobile marketing innovator has made Scottish students more connected to education than ever by sending out results by text. Students traditionally receive their National Qualification results through the post from the Scottish Qualifications Authority (SQA). But this year, more than 45,000 students opted to receive their results by text message. Results day can be tense as students wait to receive their results, so the SQA partnered with award-winning mobile communications company Textlocal to make the delivery of grades more efficient and personal. SMS has proved to be the fastest and most accessible way to deliver results to students, who can access their grades anywhere, such as away from home or on holiday, as long as they have their phone with them. Receiving the information early provides candidates the most opportunity to consider their next steps. In 2006, SQA introduced ResultsOnline, a service, allowing candidates to register for online delivery of their grades. In 2008, this was re-launched as MySQA, a portal that candidates could use to access an online record of their qualifications and achievements. By registering and activating a MySQA account, candidates can opt to receive their exam results by email or SMS. The all-important results are delivered through these channels from 8am, which reduces that agonising wait for the post to arrive. Jason Palgrave-Jones, Managing Director from Textlocal, said: “Students are becoming more connected than ever to education thanks to a service that enables them to receive their results the moment they are released. As more students register with MySQA every year, the awards body foresees SMS becoming an ever more popular choice. This service also demonstrates how SQA is listening to their candidates’ needs and providing information via an accessible route. Stuart Davidson, SQA’s Director of Business Systems, said: “Our partnership with Textlocal has been incredibly helpful. Their team immediately understood how important it is for us to get candidates’ results to them quickly and efficiently on the morning of results day. SQA is the national awarding and accreditation body in Scotland and helps people realise their potential and achieve their ambitions by providing a wide range of high quality, internationally recognised qualifications and associated services. One of its suites of qualifications are National Courses and Awards, which were achieved by more than 140,000 students in 2016, from around 600 schools and colleges. Textlocal is an award-winning mobile communications company, based in Malvern and Chester, and founded in 2005. More than 160,000 users have sent more than one billion text messages using their Messenger platform. Textlocal have been transforming the way businesses communicate using Messenger. They have been listed by Media Momentum’s Top 20 fastest growing digital agencies across Europe for three consecutive years and in the Sunday Times Tech Track 100. SMS can be a more effective engagement tool for business than email or social media, because the open rate is so much higher. The average open rate across all industries is less than 23 per cent, while 99 per cent of all texts are opened and nine out of 10 are read within three minutes. Celebrations were in full swing today at Altwood Church of England School in Maidenhead, when students received their GCSE results. This year saw the school achieve their best ever set of GCSE results with 63.1 per cent of students achieving 5A*-C grades including English and maths. 87.7 per cent of students achieved A*-C in English whilst 69.2 per cent achieved the same level in maths. In the past three years, the school has gone through a period of incredible change, and these results have further cemented the fact that the school is heading in a very positive direction. There were many special achievements but worthy of special mention are: Andrew Thomson who received 7A*, 1A, 1B, Giles Gidley with 7A*, 2B, IC, Eddie Horne with 5A*, 5A, Lisanne Pereira with 4A*, 3A, 2B, 1C and Alice Cox with 3A*, 3A, 3B. Manor Church of England Academy in York has over 1,000 students and 140 staff members. Like most schools, they initially recorded performance reviews on paper, but this ran the risk of files being misplaced, developmental needs that couldn’t be tracked and material that wasn’t always on hand when needed. Here, vice principal, Mike Thunder, discusses how the school has benefitted from moving to a digital, cloud-based solution for performance management. When it came to performance management, we needed a tailored solution that was flexible to our needs and incorporated all the key elements of school improvement. With our paper-based system, staff didn’t always know what their targets were and that meant we couldn’t monitor them effectively. We chose to work with SchooliP because it provides a centralised location for staff members to see all the information they need easily and quickly. Everything is customised to individual staff members, so they can see their own objectives and reviews. They can even update their record and upload supporting evidence with the help of handy reminders to make sure that they are meeting their required actions. Monitoring professional development was also a challenge previously, as we would spend a great deal of time filling in spreadsheets with details of the courses staff members had been on and whether they had been worthwhile. However, working digitally means that staff members can now provide this information themselves in a few clicks, and we can then collect the data in one place to see where we’re allocating budget and staff time. By adding an ‘impact box’ for staff, we were able to measure the results of the training they received, which is incorporated into reports and provided for accountability to the board of governors as evidence of our spending. More importantly it also allows us to demonstrate the impact of professional development activities against teaching and learning, and school improvement. The overall impact of digitising administration for our academy means that our performance management processes, our professional development, our whole-school development plan and our self-evaluation forms, are much more effective than they were before. All staff save valuable time and effort. The real benefit is the ability to quickly and simply generate reports, as it enables us to not only access vital information easily but also to share it with our stakeholders including staff members, governors, and of course Ofsted! Our staff feel empowered by the ability to build their own portfolio of professional development and evidence that contributes towards their own performance. All staff members, not just teachers, have really taken ownership of their training and performance management, so it saves us time and we have a comprehensive record of how we’re doing as a school. The system is continuously updated to fit with education and government changes, so we can ensure that we’re always up-to-date and meeting the required standards. The main benefit of having a cloud-based system is that everything is integrated. We have everything we need for performance management and school improvement goals in one, easily accessible place! Students at King’s College London Mathematics School (KCLMS) celebrated their A-level results recently with 100% receiving an A* or A grade in Mathematics, including 83% gaining an A*. The students, who had their university destinations confirmed recently, gained strong results across all the subjects taught at the School, with 95% attaining the highest A-Level grades (A*, A or B) – placing the School amongst the very top performing state schools in the country. Nearly a fifth of this year’s leavers have accepted offers from Oxford or Cambridge, and 85% from 21 of the 26 Russell Group universities including King’s itself. All 65 students graduating from the specialist state-funded School for mathematicians aged 16-19 were selected for their particular enthusiasm and aptitude for Mathematics and received their results along with around 300,000 students across the country. The School’s average point score per A-level entry (272.9) is in fact higher than any other UK state school’s average point score in 2015. 43% of the first leavers are girls, who just outperformed their male counterparts both on average point score per entry and on Oxbridge offers. It is not just the leavers who are celebrating, however, as 92% of the School’s new student intake welcomed last autumn attained an A or B grade in their AS results and over half of the year group achieved at least three A grades. King’s have been involved in the development of the curriculum at the School, which combines Mathematics, Further Mathematics, Physics, Economics and Computing A-Levels with the Extended Project Qualification that will enable students to pursue individual research and construction projects. The relatively high proportion of girls at the School shows that it is improving historically under-represented girls studying these STEM subjects (39% in Maths, 29% in Further Maths, 21% in Physics, 9% in Computer Science, 32% in Economics). Mr Abramson’s aspiration is for students to be motivated by inspirational staff as well as by each other, and to learn in a dynamic space designed to nurture creative thinking. By Kate Robinson, Editor in Chief, HundrED. Education is a human system. Sir Ken Robinson describes it as being ‘not an impersonal, inert engineering system, it’s constantly in flux and changing. It exists in the actions and activities of people every day.’ This means that, as with all human systems, it is unpredictable and subject to influence by any amount of circumstances – making it impossible to guess what the future of education will look like. How the next 100 years of education should look however, depends on a number of factors, including what the purpose of education is believed to be, and whom education is believed to be for. With that in mind, we turned to 100 education thought leaders, influencers and change makers from across the world to discover their views. Still, there is no denying that education certainly should be playing a significant role in equipping our children with the tools they require for life in the 21st century. Across the board, our interviewees repeatedly raised concerns about the way children and young people are currently being educated. These range from too narrow a focus on academic skills, to counter-productive learning environments, to assessment that is far too standardised and not based on real-world concepts that students can relate to. So how do your personalise education? Andy Hargreaves of Boston College, USA, amongst others, believes that ‘learning how you learn’ is a critical skill that schools should be encouraging. Helping students to discover how they each learn best is the first step in personalisation. Once students feel empowered to take an active role in their learning experiences, the teacher can then work in partnership with them to best suit the needs of the class and the individuals in it. Learning to learn is just one skill raised in our interviews that our interviewees feel schools have a responsibility in encouraging. In addition to traditionally valued skills such as numeracy and literacy, leaders in the field are also calling for an additional set of competencies to take centre stage. It is also important to mention that digitalisation in education is not implemented at the cost of outside, real-world learning. The value of embracing nature and alternative learning environments is something brought up time and time again. For example, Abdul Chohan, CEO of the Essa Academies Trust (Essa Academy in Bolton was the first school in the UK to equip each student with an iPad) makes the point that ‘the world is really a classroom you should be able to go out and explore’. The matter then to consider is how best to use technology to create a variety of learning experiences. All of these changes require a different approach to teaching, and across the world the role of the teacher is already shifting. There is a dedicated and determined community of educators who are challenging the status quo in their schools and classrooms on a daily basis. This is crucial, as in the age of information the traditional role of the teacher as an all knowing vessel of knowledge has passed. This of course means that teachers need additional support in this transition. Susan Crichton, of the University of British Columbia, Canada, raises the point that ‘often we want teachers to teach in ways that they’ve never experienced as learners themselves, and then we wonder why they struggle to do that.’ Teacher training and support needs to be re-evaluated as we move into this next era of education. This is a critical point to make, and possibly the most important – children should be involved in shaping the future of education. The next 100 years of education should empower students to harness all of the tools and opportunities at their fingertips to take control of their own learning and experiences. Children and young people are not impartial bystanders, they are not test results, numbers or figures on a league table. They are invaluable to our shared future. They are the future. Chandrika Bahadur, Director of Education Initiatives at SDSN, India asserts that ‘there is no country in the world that gives its citizens an equal and equitable right to a prosperous life without having invested in large scale public education.’ It is time we started including children in the conversation. HundrED is a global, non-profit project aiming to bring together a vision of education for the next 100 years, collecting 100 innovations from Finland and a further 100 from around the world, along with commentary from global thought leaders. The findings will be documented as a book, a documentary, a series of international seminars and a toolkit for teachers, all shared with the world for free. HundrED is a two-year project bringing together a vision of education for the next 100 years. For decades, the Finnish education system has been hailed as one of the best performing in the world. As part of the country’s centenary of independence in 2017, the idea of HundrED is to help Finland maintain its world-leading status in education. The project is being implemented by SCOOL, a Helsinki-based start-up providing innovative learning solutions for schools to encourage curiosity and cooperation. The British Heart Foundation (BHF) is calling on secondary schools across the UK to join the largest CPR training event of its kind on European Restart a Heart Day, Tuesday 18th October1 when the heart research charity, alongside other organisations, will help support training of 100,000 children in the lifesaving skill as part of its Nation of Lifesavers campaign. The BHF’s campaign to create a Nation of Lifesavers was launched two years ago in a bid to improve out of hospital cardiac arrest survival rates across the UK, where currently less than one in ten people survive. The charity is working in partnership with all 14 UK ambulance services, the Resuscitation Council UK, British Red Cross and St John Ambulance, amongst others, to stage the mass training event which will predominantly use BHF’s Call Push Rescue training kits that are available to secondary schools for free. This follows a successful partnership activity with the Yorkshire Ambulance Service (YAS) in 2014 and 2015 where 31,000 children at 137 secondary schools across Yorkshire were trained in CPR on Restart a Heart Day. This year all ambulance services have committed to the event and it is hoped that more than 100,000 children will learn the lifesaving skill on the day this year. CPR is required immediately when someone suffers a cardiac arrest, which means the heart stops pumping blood around your body. The longer that CPR is delayed the worse the outcome, with an approximate 10% reduction in survival for every minute lost. With more than 30,000 out of hospital cardiac arrests in the UK every year, the BHF warns that the failure by bystanders to intervene is needlessly costing lives every day. If survival rates improved to match those seen in Norway, where CPR is taught more widely, up to 5,000 lives could be saved every year. To date, nearly one in four secondary schools are delivering the BHF’s Call Push Rescue training to their pupils and approximately 400,000 secondary school children have been trained. The simple and interactive kit includes a 30 minute DVD and an example lesson plan which omits the need for a trained instructor, meaning schools can a easily run the training sessions themselves and have flexibility over when this is delivered. Helen Cawthorne, 55, an ex-triathlete and secondary school teacher suffered a cardiac arrest on Valentine’s Day in 2011 – she was saved by a fast acting individual who performed CPR before an ambulance arrived. Helen, who teaches at Carlton Academy in Nottingham, said: “I know first-hand just how vital these simple skills are. Put simply, I wouldn’t be here today if that stranger, my lifesaver, hadn’t had the skills to do CPR before the emergency services arrived. Sara Askew, Head of Survival at the BHF, said; “Teaching children lifesaving CPR skills is the best way we can hope to improve cardiac arrest survival rates across the UK. Currently there are 30,000 out of hospital cardiac arrests each year and less that one in ten people survive. “Training the next generation will ensure that, from a young age, more people will have the skills and confidence to help in a serious medical emergency and more lives will be saved as a result. Kenwood House in North London is expanding its education offer from September with a brand new expert-led Discovery Visit based upon Kenwood’s connection to the abolition of the transatlantic slave trade through its previous owner, Lord Mansfield. Students will explore the role of Lord Mansfield – one of England’s greatest judges – in the abolition of the Transatlantic Slave Trade, gain an insight into the main arguments used by campaigners both for and against slavery and learn about Mansfield’s role as a senior legal figure in Britain and the impact of his rulings, in particular, the Somerset case and the Zong case. Whilst other school trips looking at this topic will explore the theme in a museum setting, Kenwood House itself has a unique connection to this particular topic as it was the former home to Lord Mansfield from 1754. In 1766 Lord Mansfield and his wife then took in their two great-nieces Elizabeth Murray and Dido Elizabeth Belle. Dido was the daughter of Sir John Lindsay, nephew of Lord Mansfield, while Dido’s mother was an enslaved African woman. At this time it was extremely rare for a mixed-race woman to be educated, literate and living at a house such as Kenwood. On the Discovery Visit journey, students will tour key rooms, use and critically evaluate a range of source material to piece together the stories of the lives of some of the individuals who lived at Kenwood. Students will be exposed to the methods of historians and the development of interpretation and be able to engage with the evidence available to form reasoned judgments of their own. The new Discovery Visit is an excellent opportunity to teach the Key Stage three History curriculum topic of Ideas, political power, industry and empire 1745-1901 outside of the classroom, and comes complete with an accompanying resource which can be taken back to school after the visit. Teachers can also link the Discovery Visit to a local history study. Guiding young people through a story of such significance at a site such as Kenwood helps to consolidate students’ understanding of this topic through discussion and debate within incredibly inspiring surroundings. Following the Discovery Visit, students will be able to consider the long term implications of the trade in enslaved Africans on the African continent and draw parallels to modern day examples of slavery such as human trafficking. They will be able to understand the story of Dido Belle and her life at Kenwood House and consider her experience and use that to contrast with the experience of other black people within 18th century London. In addition to the life of Dido Belle, students will be able to make a judgment on the significance of Lord Mansfield and his legal rulings within the context of the Transatlantic Slave Trade and the Abolitionist movement. The visit also includes using a variety of sources and handling items, plus a resource which has been developed to support the visit. The learning outcomes are also specifically tailored to fit within national curriculum requirements for history. The Kenwood Connections: Lord Mansfield and the abolition of the Transatlantic Slave Trade Discovery Visit can be booked now charged at £100 for a maximum of 30 students per session. Visits are available Tuesday, Wednesday and Thursday all year. Schools are advised to call the English Heritage Education Bookings Team to check availability and to book on 0370 333 0606. 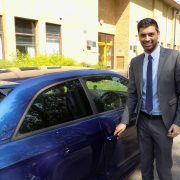 Not going to university was my best decision ever…..
Liam Patel at PET-Xi’s offices in Coventry. Having left 6th form college with a Level 3 BTEC in business, I could have applied to university, but I chose the apprenticeship route instead – and I’m so pleased I did. My job as a social media and digital marketing apprentice at PET-Xi, who are nationally renowned providers of intensive results-based educational interventions for school children, means I’m earning while I’m learning. Gaining invaluable work experience in a real job has put me in a much better position than many of my friends who have now graduated. Many of them are still looking for a job and, on top of unemployment, have a massive student loan to repay. I have no doubts that I did the right thing. University is not for everyone. I felt it wasn’t right for me because I’m a practical sort of person who likes to get stuck into things. I knew that I’d get on better by gaining hands-on experience, rather than by studying things theoretically. I chose social media and digital marketing because I have a passion for all things digital. It’s the future. I love social media and use it personally every day. From the minute I open my eyes in the morning I’m checking the news and my various accounts – everything from Facebook to Instagram. I’ve also run the social media side of my family’s business and seen firsthand how it brings in customers and improves relationships with them. Social media experience can also be applied to lots of different business departments – for example project management and sales – and I’m really enjoying this variety. Because PET-Xi’s business is to provide training, I feel this gives them the edge over other companies I could have joined. Everyone at PET-Xi genuinely loves what they do and is expert at making things happen and getting results. It’s also great that because PET-Xi’s core business is around training provision, the offices are packed with experts to give advice and provide practical help. It’s also great for any apprentices who need extra support as they take their Functional Skills qualifications in English and Maths for example. All the apprentices have a qualified assessor who ensures we complete our work to the highest standard and provide support and guidance along the way. From my time at PET-Xi I can already see the company growing and expanding with new and exciting things planned and I feel I am part of something big! I hope in return the company is benefitting from my skills, ideas and enthusiasm for using social media in the business. From where I was, to where I am now, is phenomenal. My confidence has grown so much. I’m independent and meeting loads of interesting people. The best thing of all is that I am gaining full experience of the whole company, so I can decide where I’d like to specialise eventually. For example, I’ve gained a real interest in the funding side of business by working with that team in Coventry. Overall I am having an awesome time and can thoroughly recommend a PET-Xi apprenticeship. STABILO has teamed up with the National Handwriting Association to create a dedicated suite of handwriting resources for primary school teachers. The German-based manufacturer of writing materials will host these on a new web portal which includes work sheets, video tutorials and advice on how to improve children’s handwriting. Suitable for both teachers in the classroom and parents at home, it will also include a downloadable Pen Licence for teachers and schools, with a discount voucher for parents on their child’s first pen. “Handwriting is now part of the National Curriculum and it is crucially important for primary age children to develop handwriting skills early on. Despite the increase in digital technology, handwriting is still an essential skill, not only for presentation reasons, but also because of the benefits to a child’s cognitive development. “The supply of good quality handwriting resources in the UK which are easily accessible to teachers varies considerably, but they can certainly enhance the writing experience for large numbers of children. “Some educators may struggle with best practice in terms of teaching handwriting, because it is not part of the PGCE teacher training in most universities. Despite this, changes to assessments this year mean that children continue to be assessed on handwriting as well on reading and maths. “Teachers and parents have fed back to us the need for better resources to help with handwriting. “Children are often desperate to achieve in handwriting, but lack the resources for teachers and parents to help them with their development. School schemes such as the ‘Pen Licence’, whereby children receive a certificate when they reach a certain standard and can progress from using pencil to pen, are a great incentive for children. However, parents are often at a loss as to how they can help them reach this standard.